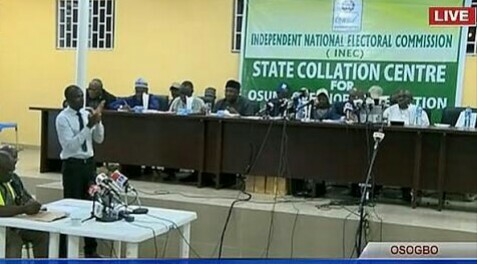 discharged its investigate governorship rerun race in Osun State. “CDD observers reported several cases of denial of access to Polling Units to observers, and even voters. CDD field observers deployed to observe the process and ensure its credibility, especially in Orolu and Osogbo LGAs, were intimidated, threatened and in some cases arrested by security forces. “CDD observers reported palpable tension in Ifon, Orolu LGAs due to the high-handed conduct of the security agents who seemed bent to sway the vote the way of certain partisan interests. “At Ajegunle Roundabout, which leads to Polling Unit 003 Ward 9 Gbogbo Primary School in Orolu LGA, security personnel mounted barricades to obstruct observers and deny them access to the polling unit. “Observers who attempted to carry out their legitimate duties were arrested and taken to nearby police station. They were only released after being denied the opportunity to keep an eye on the process so as to guarantee its credibility. “For instance, a CDD observer, Kemi Busari, was arrested by the police on the pretext that he took pictures around a polling unit. “The police officer’s stance contradicts the statement of INEC, which made it clear that voters and participants were allowed to go with their phones to polling units but not to polling booths after ballot paper must have been issued to an accredited voter. “This particular incident clearly demonstrates the fact that the law enforcement agents were not properly informed about or deliberately ignored the INEC directive, which banned the use of phones in the voting cubicle, not around the overall polling environment. In the face of the intimidation and unjust arrests, observers forced to leave the Polling Units. “CDD also observed attempts by members of the security forces to prevent some voters who allegedly belong to opposition party from accessing PU012 Olode Ward 07 in Ife-south LG, even after showing their PVCs. “Also, despite all efforts by INEC and civic group to ensure violence-free polls, some political actors mobilized thugs and hoodlums to intimidate voters, journalists and observers. Chang Mantu, a senior police officer involved in the coordination of security in the Osun election, explained in Osogbo that there was an attempt by some party men disguising as observers to gain access to Orolu in the early hours of Thursday. “He said they were arrested by the police. According to him, they loaded in a bus and when they were screened, they were found to be members of a political party. He explained the development was the reason why there were restrictions into the area as it was difficult for security officials to know those who were genuine observers and journalists. “Our observer also reported that election was disrupted in PU 17, Ward 5 Osogbo LGA as a result of sporadic shooting by some hoodlums. “In terms of the sanctity of the vote, CDD observers reported over five attempts by impostors to vote with PVCs from other Wards at PU012 Olode Ward 07 in Ife-south LGA. Although these attempts were unsuccessful, they nonetheless reflect the kind of impunity, which undermines the credibility of the process. “In the light of these anti-democratic acts, which have undermined the sanctity of the ballot therefore, we hold strongly the view that the rerun poll of Thursday, September 27, 2018 does not meet up with the minimum standards for free, fair and credible elections. “It falls short of global best practices in democratic elections which Nigeria aspires towards. The acts of intimidation by security forces and the violence unleashed by party thugs are suggestive of an attempt to compromise the integrity the poll. “Coming as the last off cycle election before the 2019 general election, the conduct of the security forces, politicians and their supporters are sources of concern to strengthening our democratic process.